Daryl arrives back at the church with Noah and the group decides to go to Atlanta to save their friends. But the plan hasn't been decided and there's a little debate on the podcast about how the best plan of attack should be. They decide not to follow Rick's initial plan but is that the best course of action? We'll hopefully find out in the season finale. Happy Thanksgiving to all our listeners in the US. We're thankful for the success of our podcast and all the loyal fans! We love hearing your feedback. Click the above audio player to listen to our podcast or you can catch us on iTunes. 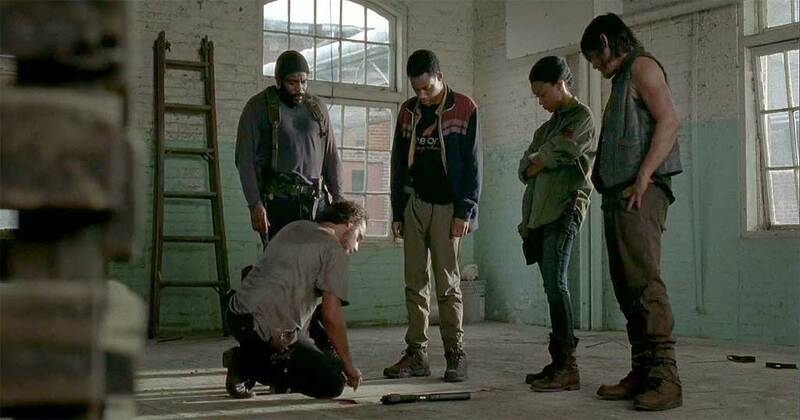 Tyreese, Noah, Sasha and Daryl look on as Rick explains his plan on attacking the Grady hospital.